Having emerged from a windless day with their precious lead still intact, PUMA are still fending off second-placed CAMPER as the pair approach what could be the final strategic milestone in Leg 6 -- the Eleuthera Island lighthouse at the top of the Bahamas. 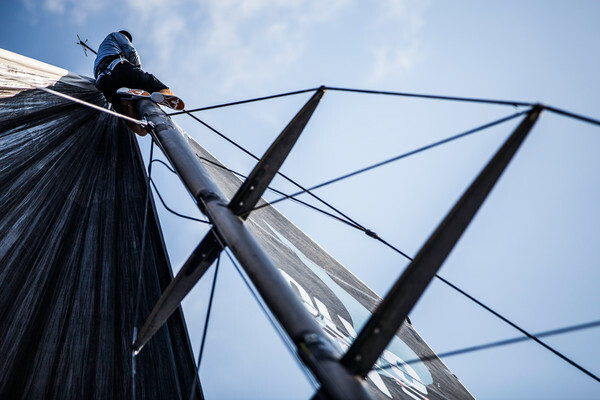 At 1300 UTC on Tuesday, PUMA Ocean Racing powered by BERG had eked out a 14 nautical mile (nm) lead over CAMPER with Emirates Team New Zealand. Groupama sailing team were a further 27 nm back in third, 16.2 nm ahead of fourth-placed Team Telefónica in a second hugely significant match race to the finish. 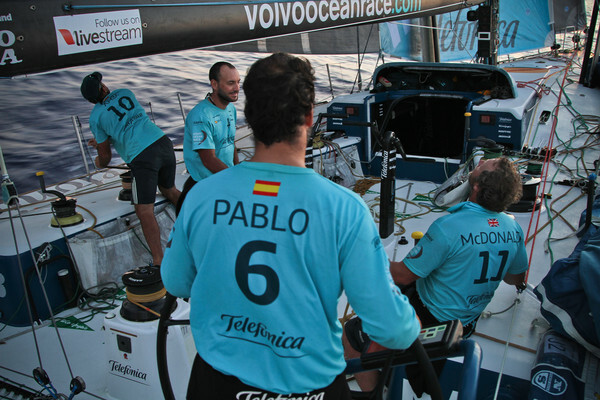 Abu Dhabi Ocean Racing remained in fifth, 111 nm off the lead. According to race meteorologist Gonzalo Infante, whoever rounds Eleuthera first will be able to breathe a little easier as steadier southerly winds fill in, meaning fewer passing opportunities on the way to the finish line in Miami. Infante said that the high pressure system which slowed the boats on Monday is moving south east, meaning the leading pair will be sailing downwind to the turning mark as the wind veers progressively from north east to south east. 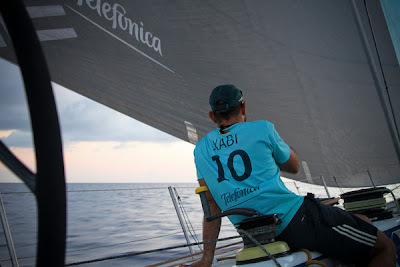 Infante said the battle for third place between Groupama and overall race leaders Telefónica could also be decided by the time they reach the lighthouse on the north east corner of the Bahamas. 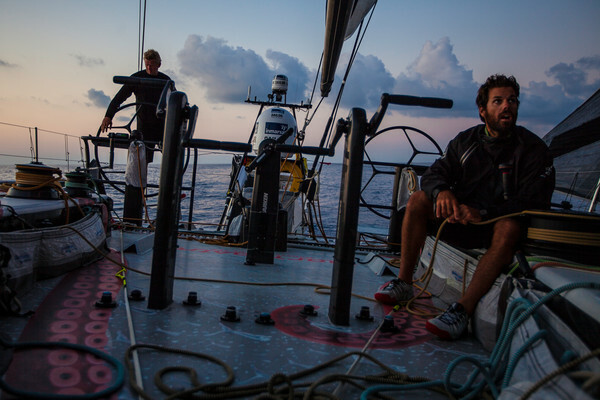 PUMA Media Crew Member Amory Ross said that at one point the previous day the leaders had been left drifting helplessly in a complete flat calm off the Bahamas, before fresh breeze arrived to get them back on their way. 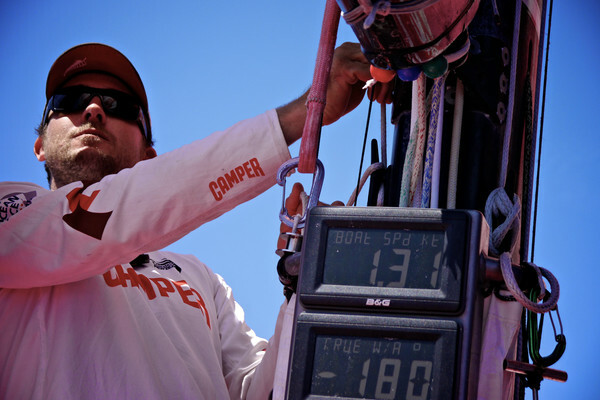 “We managed to make an escape, barely hanging on to a small but meaningful 10-mile lead over CAMPER in the race to the Eleuthera waypoint,” he wrote. 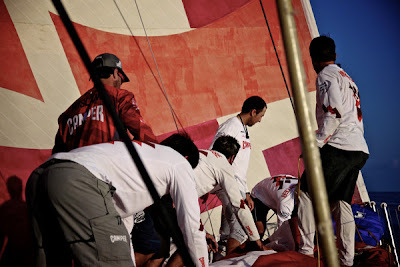 Ross said that, relieved as they were to have kept the lead they have had virtually since the start of Leg 6 in Brazil, the PUMA crew were far from complacent about closing out what would be a second successive offshore victory. “It’s hard to know whether we’ve seen the worst,” he said. 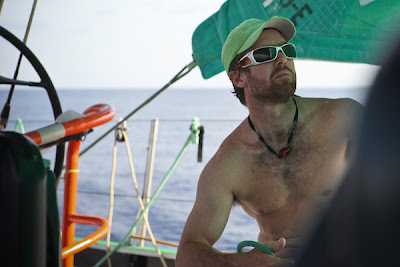 “Weather systems like this can evolve quickly and according to our navigator Tom Addis, it’s a case of so far so good, but we’re not out of the woods just yet. “The winds are still light and variable and the potential for big losses to the trailing boats still exists. With just 350 miles to go it would be easy to overlook the remaining distance, but nobody seems to be making that mistake. “The proper mindset, and one we’re all emphasising, is that each mile is just as important as the next. Don’t look too far beyond the horizon because this race is far from over." 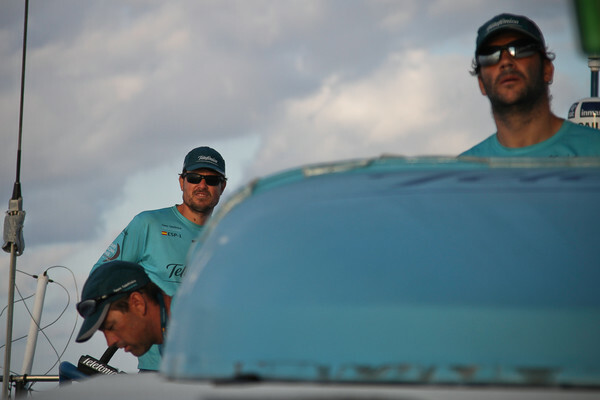 For Groupama skipper Franck Cammas, hopes of catching the leading pair have faded, leaving them to focus on defending the final podium position on the leg. “We don’t have real lateral stretch with the two leaders, so we can’t expect to carry on getting nearer and nearer to them,” Cammas said. “At some point, we will get the same wind as them. 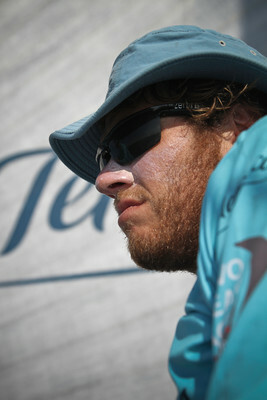 Telefónica skipper Iker Martínez said it had been difficult to watch PUMA and CAMPER sail away in new breeze which never materialised for the overall race leaders, also leaving them unable to defend against Groupama. Nevertheless, Martínez said he and his crew would fight until the end to get back to third before the finish, particularly given that Groupama are their closest rivals in the overall standings. 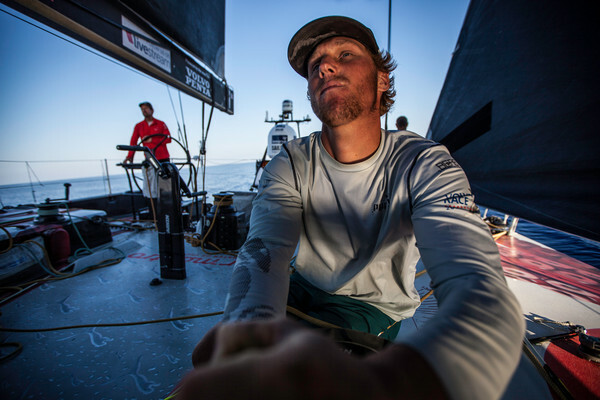 “I don’t really know about catching Groupama but for sure we’re going to try our best,” he said. “We need a little help from the wind and some opportunities. We have to be patient now. We are just waiting for a good shift to be able to be back in the game. As it stands, Telefónica lead overall by 16 points from Groupama. CAMPER are nine points further back and PUMA are a total of 32 points off the pace. The winners of each of the remaining four offshore legs, inlcuding the one to Miami, will pick up 30 points, with 25 on offer for second, 20 for third and so on down to five points for sixth. The four remaining in-port races deliver six points for the winners, with five for second, four for third down to one point for sixth. 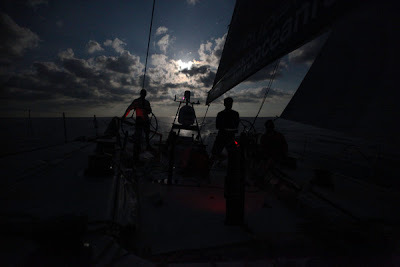 The Leg 6 winner is expected to arrive in Miami around 1130 UTC on Wednesday, May 9.